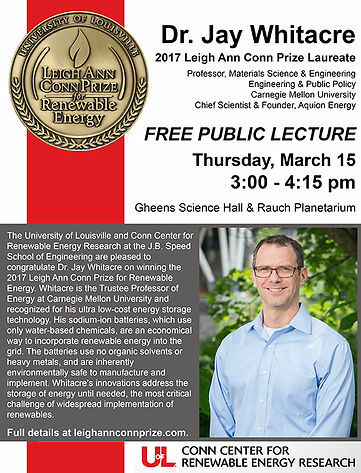 Jay Whitacre, winner of UofL's 2017 Leigh Ann Conn Prize for Renewable Energy, will give a public lecture March 15th. An international pioneer in sustainable energy technology, Whitacre’s free lecture will begin at 3 p.m. at the UofL Gheens Science Hall and Rauch Planetarium. Middle and high school students are encouraged to attend. Whitacre, director of Carnegie Mellon University’s Wilton E. Scott Institute for Energy Innovation, is known for his work with sodium-ion batteries, which are an economical way to incorporate renewable energy into the grid. While at UofL, Whitacre will receive the Conn Prize medal and $50,000 award at a dinner in his honor. The Leigh Ann Conn Prize is given every other year by UofL’s Conn Center for Renewable Energy Research at the J.B. Speed School of Engineering. The prize acknowledges ideas and achievements in research related to the science, engineering, technology and commercialization of renewable energy. It is named for the late daughter of Hank and Rebecca Conn, who are center supporters and prize benefactors.